Car buyers are pretty predictable. When gas prices plunge, we buy big SUVs and trucks. When gas gets expensive again, we buy used fuel-efficient cars with the best gas mileage. But if you think about it, that’s pretty short-sighted behavior. Gas prices zig-zag like Charlie Brown’s shirt, but you may own your car for 10 years or more. The best way to save money in the long run is to search for cars with the best gas mileage. And the best way to save money in the short term is to look for used cars under $10,000. Here’s the best of both worlds: Compare.com has compiled a list of smart picks for fuel-effiency, including conventional, electric and hybrid vehicles. When the Toyota Prius was first sold in the United States in 2001, it cost around $20,000. The idea of a hybrid car under $10K seemed ludicrous — but now, it’s easy to find them. Here are our picks for the best used hybrids and electric vehicles under $10,000. The 2013 Ford Focus Electric is a five-passenger electric vehicle that gets 76 miles of range on a fully charged battery. This car has a comfortable cabin, 143 horsepower and can be fully recharged in about 4 hours using a 240 volt power source. It comes in several trims and you have options for features so its one of the more stylish electric cars. If you are looking for a quiet, comfortable commuter ride under $10,000 this is the car for you. When the Volt was first released, many thought this vehicle was a purely electric vehicle because of its name. It is a plug-in hybrid that was ranked #2 in 2012 Hybrid cars and gives you about 25-50 miles of range and can reach speeds of up to 100mph before using a single drop of gasoline. Once the battery charge is 70% depleted, the gasoline engine kicks in giving you about another 300 miles. If you have a short commute, this car would be the most efficient for you as you could get to where you needed to be only on the battery power. If you have a bit of a longer commute, the Volt averages about 33mpg which is a little lower than most hybrid cars but still decent for 4 passenger cars of its size. Like its predecessors, the 2012 Toyota Prius is a market leader for vehicles of its type. It has excellent fuel economy and a sizable cargo area. It gets 51mpg in the city and 48 on the highway. In 2012, Toyota also introduced the Prius Plug In Hybrid which was essentially the same exact everything of the Prius Hybrid except it had a larger battery and could go about 13 miles in electric mode at speeds of up to 62mph. Regardless of which one you choose, going with a Prius will save you money and you’ll have one of the most fuel-efficient hybrids out there for under $10,000. This hybrid has an EPA estimated 44 city and highway mpg. It’s a 5-passenger car with decent space both up front and in the back. Unfortunately, the interior has multiple plastics which reviewers think it makes it look cheap rather than the stylish interiors of other comparable cars. If fuel efficiency is what you’re looking for, this car fits those needs and your budget! Tiny is mighty when it comes to fuel efficiency, and these small wonders are all good bets. This subcompact car has great fuel economy, is easy to maneuver but comes with less cargo space than comparable cars. The Spark is a four-passenger car with 30 city and 39 highway mpg making it a very gas powered fuel efficient car. A new 2018 Chevrolet Spark starts at $13,050 so it is easy to find a used model for under $10,000. The Nissan Versa is a leader in passenger and cargo space for subcompact cars. It is a five-passenger car and has an mpg of 31 city and 40 highway. Reviewers state that the inside of the vehicle is made of cheaper plastic materials. If stylish looks are what you’re looking for, this probably isn’t the car for you but if you want a budget friendly, fuel efficient car than look no more. Like the rest of the Toyota family, the Yaris has a great reputation for reliability. This 5-passenger car gets an mpg of 30 city and 37 highway. It has a stylish interior and decent passenger space but cargo space is limited. The 2018 Toyota Yaris is Toyota’s least expensive new car so you can easily save money on a 2016 model that are priced around $10,000. The 2016 Hyundai Elantra is the largest vehicle (passenger space and cargo space wise) on our list that is still very affordable and fuel efficient. It has 173 horsepower and 28/38 city/hwy mpg. It is available in multiple trims so you have some options to decide on style and looks. 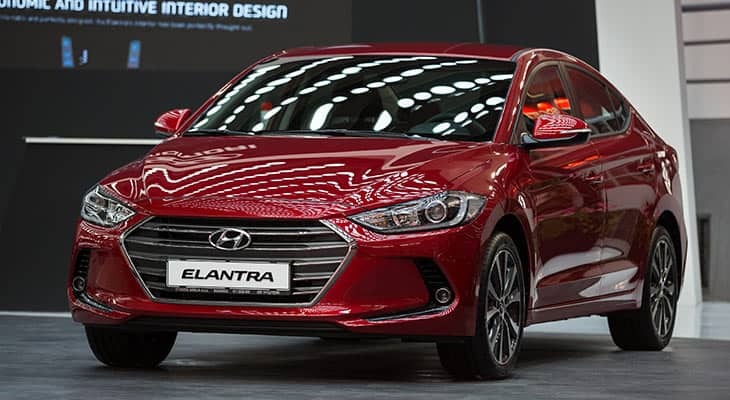 This vehicle was fully redesigned in 2017 which means that newer versions would be pricier but the 2016 Hyundai Elantra is a budget friendly vehicle that is priced around $10,000. Do you plan on buying a new or used car in the near future? Read our tips for car buyers. And once you find your perfect ride, use compare.com to compare car insurance quotes online to find the best rates available.